This book will both arouse your curiosity and answer your questions. Why are there so many different kinds of telescopes? 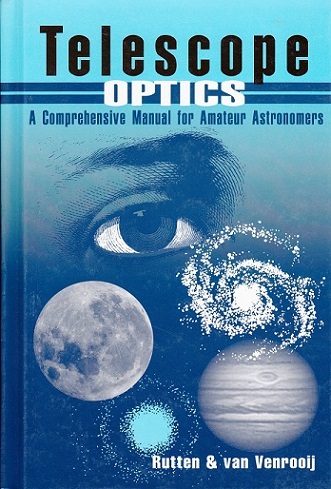 What does each type of telescope have to offer? What makes one telescope better than another? Which is best? Why? What are the trade-offs? As a telescope buyer, you will be better informed; as a telescope maker, you will be able to design custom optics. Many readers will find the analyses of existing designs the most valuable part of the book. Newtonians, Cassegrains, Maksutovs, Schmidt telescopes and more are described and analysed so that you can easily compare them. What’s your dream telescope? This book will help you choose it. Others will make use of the power they now have to check, test and analyse new scope designs. The design and raytrace programs available as an option to this book will give you the tools you need to begin with a basic design and work systematically until you have created an optimized optical system that meets your personal design criteria. You’ll be able to try new types of glass, design a telescope around that corrector shell you have parked in the basement, even compare the performance of many different eyepieces on your telescope. No longer must you, as an amateur astronomer, meekly accept someone else’s opinion about a telescope design. You can scrutinize existing designs and improve them to meet your own standards.